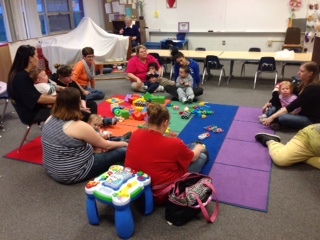 Participants in the PIWI (parents interacting with children) program designed to prevent abuse and neglect. Part of the belief that whether a parent abuses a child is that family’s personal “business” is the failure to admit that the outcome of abuse affects all of us. How? Countless obvious ways . . . and some that are less obvious. Caring for the physical effects. The brain impairment from injuries sustained during abuse, or malnourishment from neglect leads to long-term consequences for the child’s cognitive, language and academic abilities. Aside from the obvious moral tragedy this presents, it also presents an economic problem for our future workforce. This disabling of populations of future employees is preventable. If we fail to prevent it, we’ll be presented with a host of other expenses, including welfare and public assistance for those too damaged to care for themselves, and the children that they produce. Beyond that, studies show that children from abusive environment are far more likely to suffer from allergies, arthritis, asthma, high blood pressure, ulcers and other chronic health conditions that the state will likely have to pay to treat. Managing a mental health crisis. The amount of recent discussion about a need for a more comprehensive and effective mental health system has failed to address one key reality: childhood abuse and neglect is the cause of many mental illnesses. Up to 80% of young adults who had been abused could be diagnosed with at least one psychiatric disorder by age 21. Anxiety, depression, antisocial and borderline personality disorders, propensities toward violence and suicide attempts were included in the mix. By ignoring the prevention of child abuse, our society has a hand in creating more mentally ill and dangerous individuals. Curbing crime and its costs. Abused or neglected children are 11 times more likely to be arrested for criminal behavior as a juvenile and nearly 3 times more likely to be arrested for violent and criminal behavior as an adult. 2/3 of people in drug treatment program reported abuse as a child. The data is in. Abuse and neglect creates criminals. And criminals make life more dangerous for all of us and more expensive for taxpayers. Take a cue from the kids who come out unscathed. There are plenty of examples of people who have survived abusive or neglectful childhoods and gone on to be contributors to their communities. What did they have that other children didn’t? Studies say it was resilience that comes from various protective factors in their lives, plus certain personality characteristics – like creativity, humor, optimism. Protective and promotive factors like these can be infused into families by the community. This is how we can prevent abuse and protect children from the long-term affects of abuse.